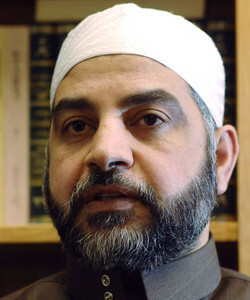 In an August 2007 sermon, Imam Mohammad Qatanani of the Islamic Center of Passaic County in New Jersey characterized Jordan, Syria, Lebanon, and Palestine (including Israel) as land that should belong exclusively to Muslims. He also noted that Muhammad commanded that all of it should be conquered. Qatanani can be heard speaking Arabic in the background while someone translates his sermon into English in real-time. Qatanani: You see then the blessed prophet brothers and sisters chooses that the land of Greater Syria, and that includes Palestine, Lebanon, Jordan and Syria – it is the Greater of Syria, these Assyria and Jordan was done by the occupation. You see that if you truly believe in these borders that means you believe in what the occupationer did. You see Syria, Palestine it's all the Greater Syria, Bilad al-Sham, it is the Greater Syria. You know some people might not like this, but this is the truth – it's all the Muslim land, this is Greater Syria, and Allah had called it in five places in the Quran as a blessed place. And it was narrated in a hadith that they are the most beloved lands to Allah. You see listen to the blessed prophet, says that he gives the companions good tidings that the greater Syria will be actually conquered. You see if you conquer the Holy Land or Al Aqsa Masjid that you are in struggle till the hereafter.